The length of the ski run reaches 360 m. The ski slope is groomed. It is open till 9.00 pm. There is a drag ski lift and ski equipment rental. It is also open until 9.00 pm. The frozen and hungry skiers can benefit from the buffet, where they can have pizza, Polish pierogi or another hot meal. It is the largest resort in the region. Snowed ski slopes are suitable for everyone. 8 km of ski runs, chairlifts and drag lifts, ski schools and equipment rental. In the summer season enthusiasts of cycling can cycle across the mountains by specially designated bycicle routes and test their endurance and physical condition. There are also excellent conditions for paragliding. 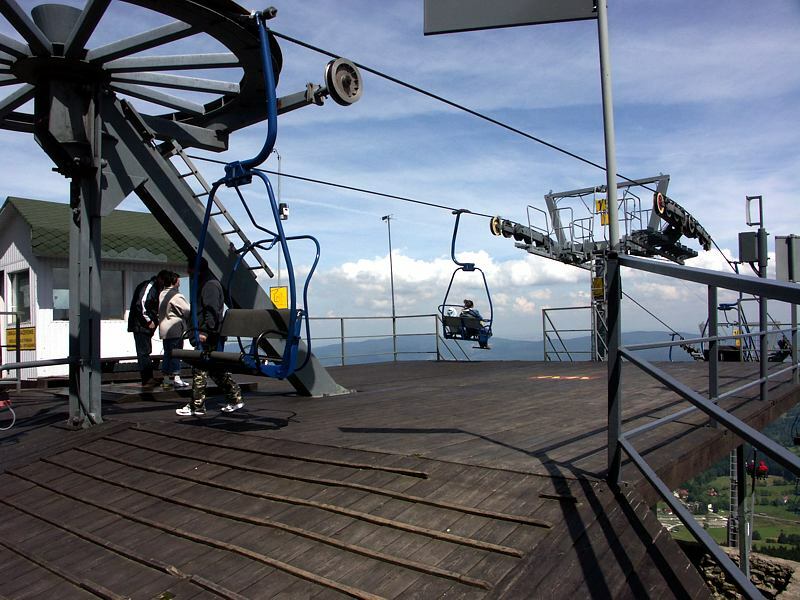 The ski-lift in Nowy Gieraltow offers a ski slope that is perfectly suitable for driving lessons. More advanced skiers will be pleased with a picturesque downhill. The ski-lift invites to night skiing. Facilities: refreshments, WC, car park (free of charge), ski equipment rental. 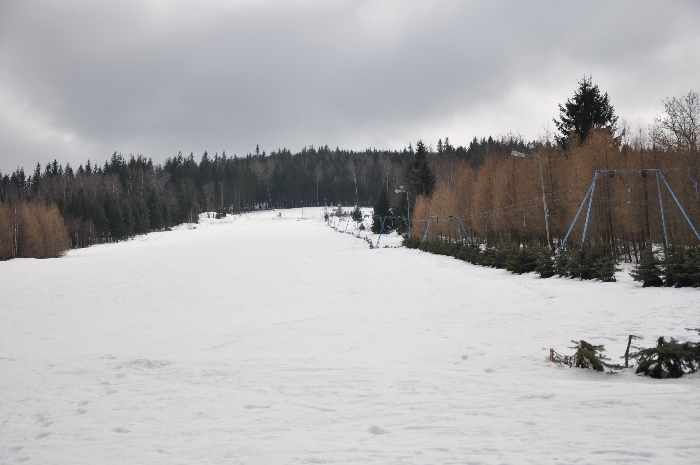 There are four marked ski-lifts on the slopes of the Zawada mountain. 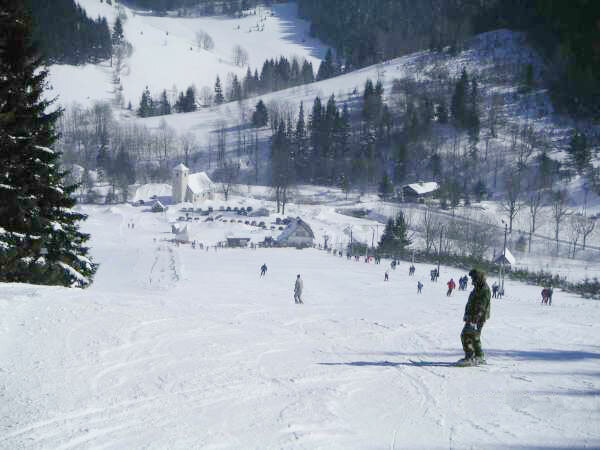 Ski runs are not difficult and are perfectly suitable for beginners and intermediate users. 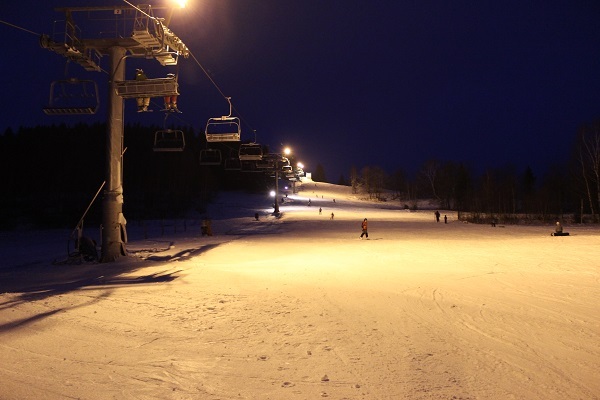 Downhill skiing by night is a great experience. Elongated shadows, twilight and relying on your own senses, extremely sharpened by difficult conditions, can become a source of many interesting emotions. Bielice is a starting point for many mountain trips. 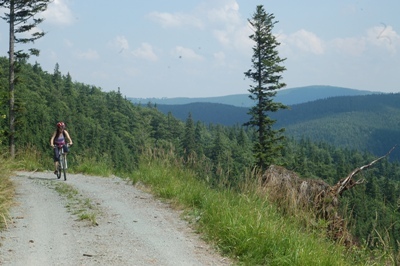 Variety of both marked and unmarked trails offers everyone a choice: walking trails that run at the bottom of the valley, forest tracks and mountain trails with steep climbs are crowned with extensive views over the entire Sudetes land from Sniezka to Pradziad. But a trip does not mean only a walk and march. It is also observation of living nature (virgin forests, mountain meadows, wild animals) and geological features (rushing streams, granite-gnessic rocks). Trips imply getting to know cultural monuments (baroque churches, roadside shrines, wooden Sudetes cottages) and history of the region called the Klodzko Land (great historical events, local traditions, legends). Most of the tracks are also cyclists friendly. The cave was discovered during the process of marble exploitation in 1966. Due to the large ammount of animal bones that occurred in the cave the exploitation was stopped and speleologists and paleontologists entered the cave. As it turned out, the remains belonged to animals of the Pleistocene period (about 10 thousand years ago). Most of the remains belonged to the cave bear therefore the cave was called after it. Among the remains, bones of the following animals were identified: cave lion, cave hyena, wolf, marten, bats, beaver, deer, wild boar, fox and many rodents. The tourist route is comfortable, well-lit and properly secured. 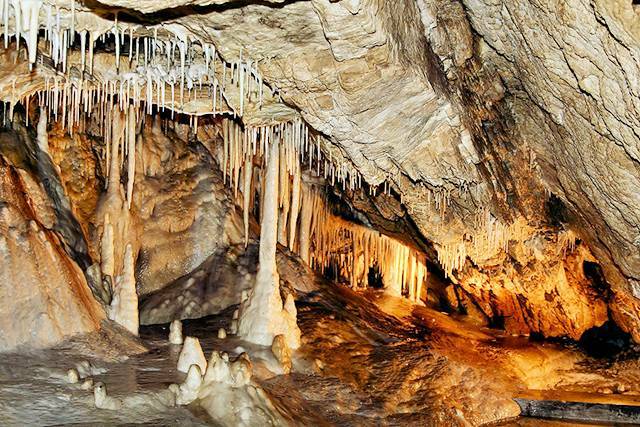 On the length of 360 meters, apart from speleothems, stalactites and stalagmites one can see the skeleton of the cave bear, the Bat Hall, the cemetry of the Pleistocene animals, helictites, flower-shaped or cauliflower-shaped calcite, pearls and many more attractions. In the mid-twentieth century the uranium ore was mined here for the Soviet military industry. Visitors walk the 200 m way and watch attractive occurance of local minerals (fluoride, quartz, etc.). You can find here the only collection in Poland that includes four fossilized nests of dinosaur eggs dating back over 70 million years. 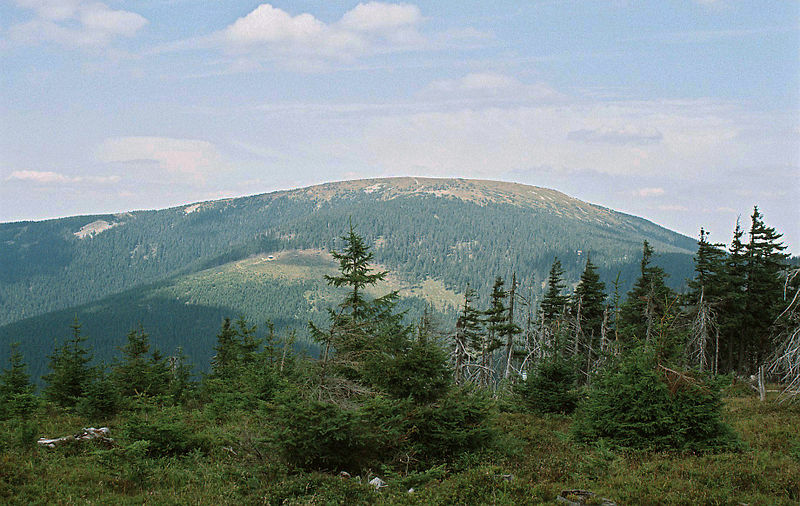 The Klodzko Snieznik (1425 m above sea level), through which the Polish-Czech border runs, is the highest summit in the Polish Sudetes, except for the Karkonosze. It is a perfect destination of the all-day hiking. From the top of the mountain one can admire a fantastic panorama of the Sudetes, the Silesian Lowland with the lights of Wroclaw and the Moravian Upland. The Snieznik is also a nature reserve with the belt of subalpine flora, Pleistocene debris, spruce forest, dwarf mountain pine and…chamois. 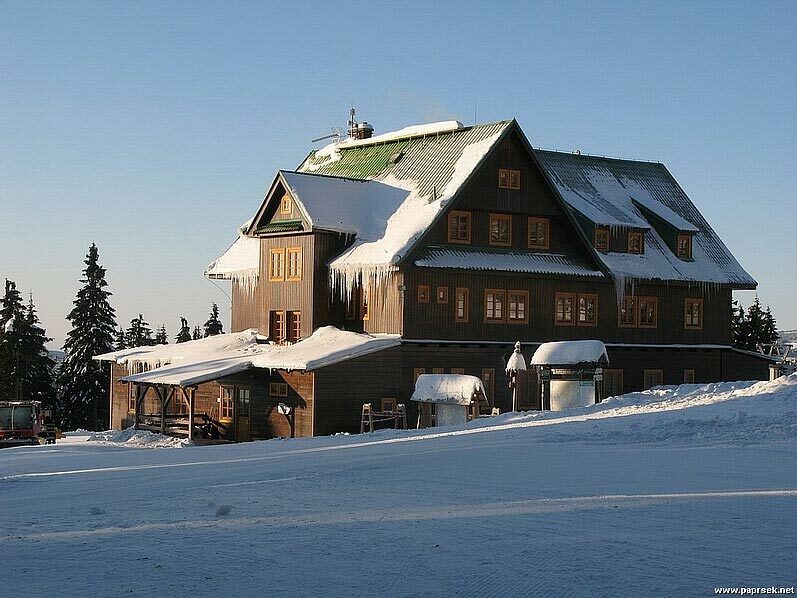 On the Polish side, there is a 19th century mountain hostel, formerly known as „Szwajcarka“, on the mountain pasture near the top of the summit. On the Czech side, there is a mysterious sculpture of an elephant at the ruins of the hostel. Symposia, graphic and papermaking workshops, concerts and other amazing artisctic events are organized here. Summer heat can be spent on walks in nearby forests or cooling in a nearby guarded bathing beach „Zalew“. 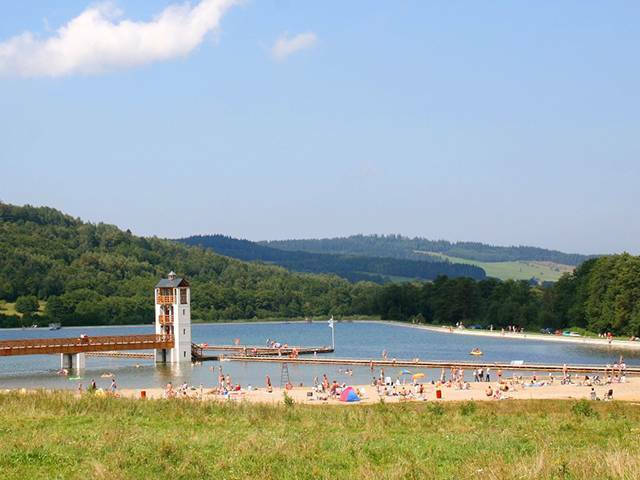 Those who love sun bathing might be intereted in a sandy beach and a green area around the lake. Photography enthusiasts can also find a lot of attractions here. The area is rich in a large number of small reptiles, amphibians and insects of all types. It is a perfect place for macro-photography. The spa is famous for its geothermal waters with healing properties. The most famous and representative building is the Wojciech Physiotherapy spa. It was raised in place of an older building based on the model of a Turkish bath. The spa towers over the thermal park attracting attention form afar. 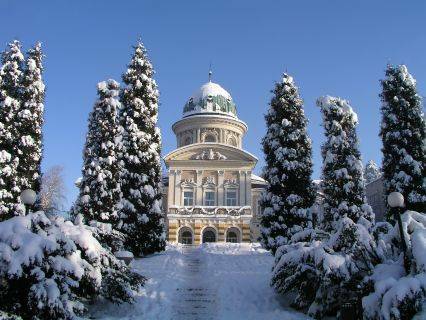 Inside the building there are marble warter intakes, the 19th century baths and a thermal bath. In the spa visitors can enjoy sulphide-fluoride and pearl baths, whirlpool and vibratory massages, power shower and mud treatments. It is also worth visiting the downtown of Lądek Zdrój with its cobbled town square, baroque tenements, arcades and Neo-Renaissance town hall. The mountain hostel was built in 1930s. It is located 1030 m above sea level and at 1km distance from the Polish-Czech border. You can get there either by climbing the Biala Ladecka mountain or by car via Przelecz Ploszyna (mountain pass). The hostel restaurant offers dishes from the Czech cuisine and beer from the brewery in Hanu šovice. Visitors can enjoy a wide panorama of the Jesenniki mountains. The mountains were formed 30 million years ago and represent one of the few plate mountains in Europe. To preserve the natural and landscape values the National Park of the Stolowe Mountains was established. 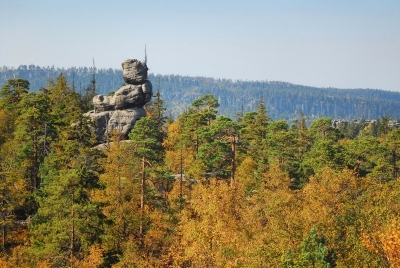 Flat plateau of the mountains (from which the name derives) is covered with spruce forest and various rock shapes that resemble castles, human figures, animals and…mushrooms add variety to the mountains. Szczeliniec Wielki (919 m above sea level), whose fantastic rock carving and deep rock crevices are filled with lying snow, has inspired a lot of legends. The mountain that remebles a truncated cone towers over everything. The Błędne Rocks are also worth visiting. They form a mysterious labyrinth, where it is easy to loose all sense of direction and get lost. Here you can experience thrilling emotions (mobile phones are out of range). The name of the nearby town Złoty Stok derives from gold that was found here. 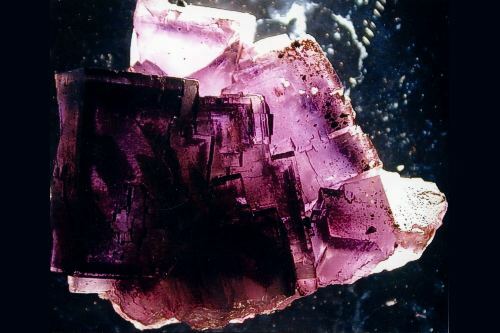 Almost a thousand year tradition of extraction of this noble precious metal started with collecting the gold ore on the slopes and continued with more and more sophisticated exploitation of discovered veins of gold. The mining boom occurred in the 16th century. Then the output ammounted to 60-140 kg of gold per month. It was about 8% of output in the whole Europe. 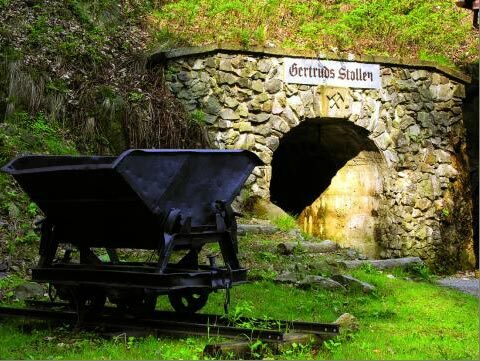 The gold mine operated until 1861. 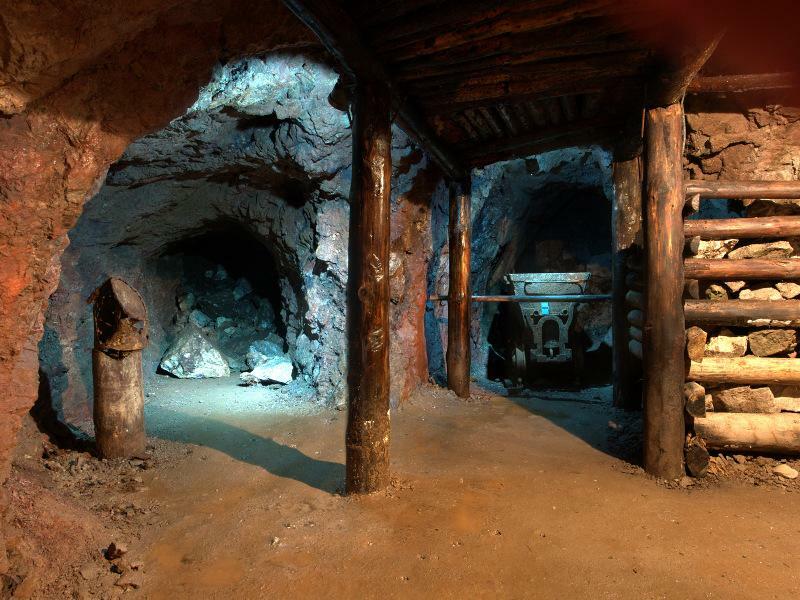 The mine consists of 300 km of drifts, mineshafts and walkways spread out over 21 levels. Two drifts have been made available to tourists. 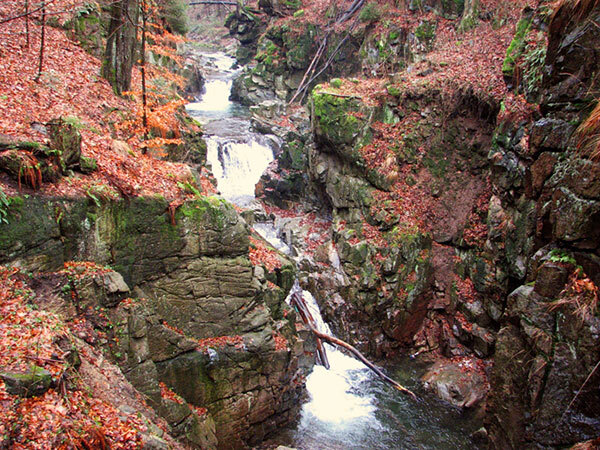 In one of the drifts there is the only underground waterfall in Poland (8 km). In 2003 and 2008 the gold mine was awarded a certificate for the Best Tourist Product. The waterfall on the river Wilczka is the second largest waterfall in the Polish Sudetes (22 m). 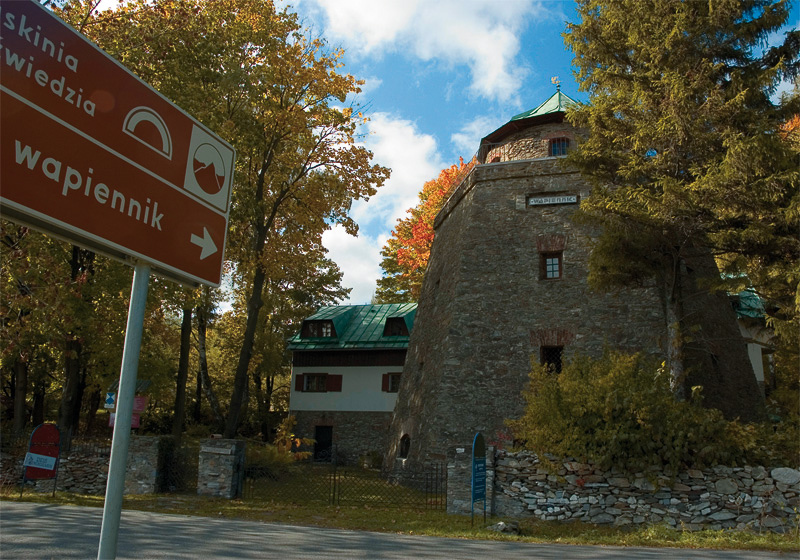 It is located within the borders of the Snieznik Landscape Park. Water falls into the carved cirque from the rock step of about 3 m and continues to flow through the deep canyon, whose walls reach 30 m in height. The place is available to the public. There is a steel small bridge above the waterfall. On the opposit side there is a vantage point. On the area of the established reserve there is an old beech forest with an admixture of fir, sycamore and spruce. The refreshing air of the forest and the sound of falling water will make you feel better and let you forget about reality that has been left somewhere far away. The rope park was formed in 2006. It takes full adavantage of naturally formed terrain – the valley of the stream, forest and quarry. Those who love thrilling emotions can benefit from balancing bridges, walking the tightrope, air surfing, etc. The total length of all the attractions amounts to 1000 m (see the map of the routes). The degree of difficulty is diversified. It varies from very easy routes (there is even a route for children) to extremely difficult and challenging routes that demand real courage. 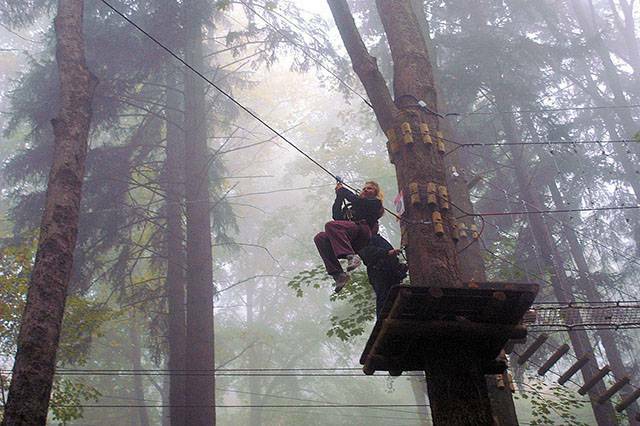 The thrill of emotions and breathtaking views guarantee a lot of fun. Pontoon rallies are a perfect form of leisure activities. 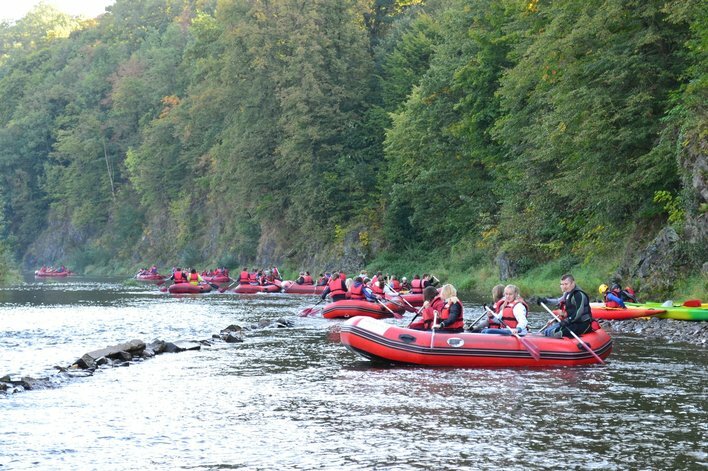 We recommend to sail across the Bardzki Przelom on the Nysa Klodzka, which is one of the most beautiful places in our country. This route is so unique that several thousand people have already appreaciated it. Thus, it deserves to be called the biggest attraction of the Klodzko Valley – Przelom Bardzki- the Miracle of the Sudetes. This pontoon rally is a five meanders trip among the rocks that are several meters high, forests that descend to the river and colourful, fragrant, breathtaking meadows.